“The Christian Wilderness Weather Kids: Stormi Rain and Layla Lightning’s Big Foot Country Tale” from Christian Faith Publishing author Regina Risner Arnold tells the tale of Stormi Rain and Layla Lightning’s big adventure. After moving to Granny Ina Ice Storm's farm, these lovable friends experience an unbelievable encounter with a creature of legend. “The Christian Wilderness Weather Kids: Stormi Rain and Layla Lightning’s Big Foot Country Tale”: Stormi Rain and Layla Lightning’s encounter with a creature of legend. “The Christian Wilderness Weather Kids: Stormi Rain and Layla Lightning’s Big Foot Country Tale” is the creation of published author, Regina Risner Arnold, a wife, mother, and Christian country woman. Regina is a homemaker as well as a home educator due to her religious beliefs. She is also a tribal member of the Choctaw Nation of Oklahoma with a MEd from Southeastern Oklahoma State University. She spends most of her time on the road traveling the United States with her family in an RV. Her travels have inspired her to reconnect with her love of writing, which began in the fifth grade. Her favorite pastime is creating wild stories for children. Published by Christian Faith Publishing, Regina Risner Arnold’s new book tells the tale of Stormi Rain and her encounter with a creature of legend. Stormi Rain and Layla Lightning move from a circus city to Granny Ina Ice Storm's farm. Living in a barn, a girly girl and her dog must learn to adapt to backward country life. One day, Wendy Air and Theodore Thundercloud tell them the Tale of Big Foot. Soon afterwards, the unthinkable happens during a typical outing with Layla. Stormi is left searching for answers as she tries to figure whether her experience was pure fantasy or a bona fide encounter with a legendary creature. View a synopsis of “The Christian Wilderness Weather Kids: Stormi Rain and Layla Lightning’s Big Foot Country Tale” on YouTube. Consumers can purchase “The Christian Wilderness Weather Kids: Stormi Rain and Layla Lightning’s Big Foot Country Tale” at traditional brick & mortar bookstores, or online at Amazon.com, Apple iTunes store, Kobo or Barnes and Noble. 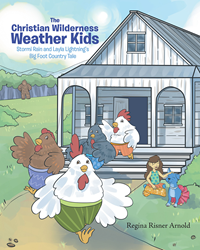 For additional information or inquiries about “The Christian Wilderness Weather Kids: Stormi Rain and Layla Lightning’s Big Foot Country Tale”, contact the Christian Faith Publishing media department at 866-554-0919.